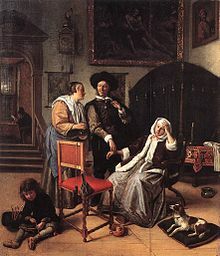 La visita del doctor, óleo de Jan Steen (siglo XVII). ↑ Frommer M, Rubin G, Lyle D. The NSW Health Outcomes program. New South Wales Public Health Bulletin. 1992; 3(12): 135-7. ↑ Long A, Jefferson J. The significance of outcomes within European health sector reforms: towards the development of an outcomes culture. International Journal of Public Administration. 1999; 22(3):385-424. ↑ McKee M. Measuring the efficiency of health systems. BMJ. 2001; 323:295-6. ↑ Bilsker D, Goldner EM. Routine outcome measurement by mental health-care providers: is it worth doing?. Lancet. 2002: 360(9346):1689–90. ↑ Black J, Lewis T, McIntosh P, et al. It's not that bad: the views of consumers and carers about routine outcome measurement in mental health. Australian Health Review. 2009; 33(1):93–9. ↑ Holland WW. European Community Atlas of «Avoidable Death» 1985-89 (3rd ed.). Oxford: Oxford University Press; 1997. ↑ Callaly T, Hallebone EL. Introducing the routine use of outcomes measurement to mental health services. Australian Health Review. 2001: 24(1):43–50. ↑ Gispert R. La mortalidad evitable: ¿Indicador de calidad asistencial? Control de calidad asistencial. 1992; 7:1-7. ↑ Gispert Magarolas R, Barés Marcano MA, Freitas Ramírez A, Torné Farré M, Puigdefábregas Serra A, Alberquilla A, et al. Medida del resultado de las intervenciones sanitarias en España: una aproximación mediante el análisis temporal y espacial de la mortalidad evitable entre 1986-2001. Revista Española de Salud Pública. 2006; 80(2):139-55. ↑ Macinko J, Starfield B, Shi L. The contribution of primary care systems to health outcomes within Organization for Economic Cooperation and Development (OECD) countries, 1970–1998. Health Services Research. 2003; 38(3):831-65. ↑ Gérvas J, Ortún V, Palomo L, Ripoll MA. Incentivos en atención primaria: de la contención del gasto a la salud de la población. Revista Española de Salud Pública. 2007; 81(6):589-96.